Gets a value from the ini-file. The command obtains a value from the key in any ini-file on a user's machine and assigns the value to a variable. Optionally, you may add comments here describing the purpose of this element. Choose the path to an INI-file. 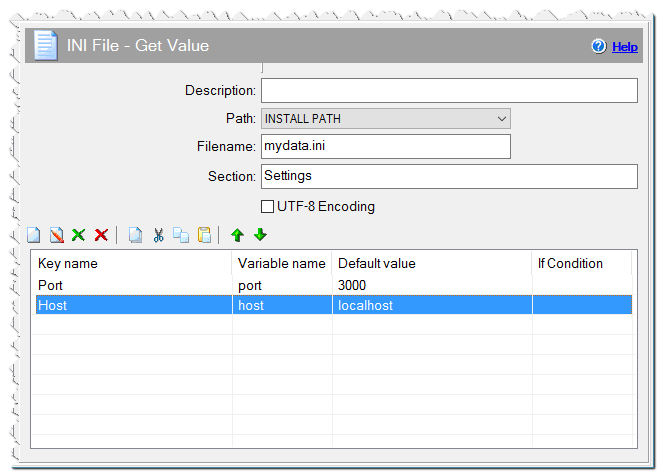 APPLICATION DATA PATH - Program subfolder in Application Data folder. CDROM PATH - CD or DVD drive. CUSTOM PATH - The path must be defined in the filename control. INSTALL PATH - Default installation path. SETUP FILE PATH - The path to where setup executable file is running. SYSTEM PATH - Windows system directory. TEMPORARY PATH - The temporary folder of the installation #tempinstpath#. It is a subfolder genteeXX in the default temporary user's folder #temppath#. WINDOWS PATH - Windows directory. Name of the INI-file. If you use a CUSTOM PATH, the full path to the file must be specified. Section, in which the key being installed is located. Check this checkbox if the INI-file has UTF-8 encoding. If the INI-file is ANSI or UNICODE encoded, do not check this checkbox. The name of the variable , to which the INI-file's key value will be written. Line used as the default value for the variable if the key is not found in the INI-file. You can specify a condition that should be met for the action to be performed. If the condition is false then the command is skipped. See How to use If Condition for more details.